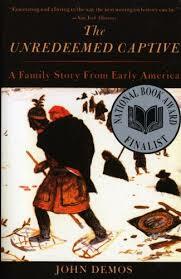 Confession: I hated John Demos’s The Unredeemed Captive when I read it in graduate school. So much so that whenever my future roommate and I became frustrated by the vagaries of our PhD experience, we’d lapse into extended wailing cries of “EUNICE!” that stretched across apartments, parking lots, and doubtless a library lobby or two. I’m not sure why it seemed so funny to us, but then, comprehensive exams do strange things to graduate students’ psyches. Part of my assessment of Demos’s work came from my annoyance at having to re-read; the professors for which I TA’d deemed it very teachable, and assigned it again and again. In the main, however, my major complaint against Demos was his use of the word “perhaps.” When I say, “major complaint,” I mean it; I just dug up my reading response for the week it was assigned (thanks, Dropbox! ), and discovered that I called it “Reading Response to Demos, The Unredeemed Captive, or, ‘A tirade on the word “Perhaps.”’” First year grad student nitpicker that I was, I’d started counting instances, and located one particular paragraph where he used the word four times. Reader, there are moments when I’d like to go back in time and punch my graduate student self in the face. John Demos, my graduate school professors, and in all likelihood some of my classmates clearly understood what the arrogant graduate student (ahem, me) failed to miss: that making overconfident assertions lands historians in hot water. I don’t know that I’m as wishy-washy as I was afraid of appearing as a graduate student, but I do know that in the side projects I’ve been working on I’ve been much more likely to offer three possible interpretations instead of definitively arguing for a single one. I’ve always been a re-reader of fiction, but the more time I’ve spent as a historian, the more I’ve also come to appreciate the act of revisiting historical classics. I’ve spent the year pursuing side projects because I couldn’t quite confront the terror of revising the dissertation. But those side projects are nearly wrapped up, and I’ve started a Word document of primary and secondary sources for the revision of Chapter One. Which brings me to the b-o-o-k project. I was told that I’d written a polemical dissertation, and received this feedback in various guises. My favorite (really!) was the suggestion that I’d “opened up some cans of worms—perhaps too many of them.” I’m conscious of the fact that a large portion of my editing process is going to involve figuring out which aspects of my argument are actually worth such invective. So this blog post is in part a public declaration to recommit myself to the idea of perhaps. Perhaps some of my arguments will remain, but perhaps some pieces of my argument—and almost certainly, large portions of my chapters—will need many more perhapses. Documentary and archaeological sources provide many clues about what Native people did as they traded and contended with New Netherlanders. It is a tricky business, however, to try to fathom what Indians thought about these interactions and about newcomers. As is often the case, an indirect and imprecise approach is the best that can be attempted. Although seventeenth-century Native ideation may be inaccessible, it is possible to say something about what Dutch people thought Indian people thought, and what those thoughts might tell us about intercultural relations in New Netherland in particular and eastern North America more generally. Pinning down the thoughts, mindsets, and goals of Indians is tough stuff. We can say what they did, and we can say what Europeans thought about what they did—but historians who presume to argue what Indians thought rarely do so convincingly. More often than not, Europeans’ interpretations of Native Americans connote more about Europeans than they do about Indians. John Demos’s main character, Eunice Williams (EUNICE), drew so many of Demos’s perhapses because she inhabited European and Indian roles during the course of her captivity (alongside the fact that there just isn’t very much documentary evidence about her). Given the fact that I’m writing a book (!!!) that deals with the free blacks, slaves, and Native Americans who left behind too few records of their own, I’m going to have to remind myself of Richter’s assertion again and again. But in thinking about the process of editing, I’m still left wondering when in the revision process I’m supposed to pin down the points where I want to stick to my guns. And I wonder, too, when you start to leech the perhapses from (or add them back into) your work. I don’t think it happens before you start writing, because what you have before you start writing should be a hypothesis, not an argument. I’m positive that at least for me, it doesn’t happen during the drafting stage. While writing my first drafts there are times when I type while looking away from the computer because I know that if I glance at the screen I will become too disgusted by the argument I’ve phrased to continue typing up the sentence (let alone the paragraph). That leaves me with the conclusion that I’ll find my perhapses during the editing process, just as I did with some of these side projects—but whereas I spent a few days doing my first editing pass on an article, the job of editing the book promises to stretch months longer. WHEN does that lightning-rod of certainty in your interpretation strike? I’m still not sure. I feel compelled to admit this not only because I am, at heart, a historian who feels the need to chronicle her life’s events, but also because I’m not happy with the fact that the process of writing the first book is a process that remains shrouded in mystery. There’s an accepted chronology of writing the dissertation, going on the market, getting a postdoc or temporary job, getting a job, and popping out the book, but I think it’s pretty clear that very few of us follow this timeline with any precision. I want to shout loud and clear that I’m still figuring it all out so that other people feel okay to do the same–and of course, to share any advice you have about revising! If there’s one thing I’m sure about, though, it’s that my final draft will have more perhapses than the rough one. After reevaluating Demos, I’m increasingly acknowledging that that’s okay. Along with Unredeemed Captive, I also own three copies of Changes in the Land and two of A Shopkeeper’s Millennium as products of my time as a TA. John Demos, The Unredeemed Captive: A Family Story from Early America (New York: Vintage, 1995 ), 162. Daniel K. Richter, Trade, Land, Power: The Struggle for Eastern North America (Philadelphia: University of Pennsylvania Press, 2013), 42-43. For an even more awesome sentence, I suggest “Atlantic trade did not so much intersect Native trade as absorb it like some vast hungry Pac-Man.” Ibid, 57. You mean, “After reevaluating Demos, I’m increasingly acknowledging that, perhaps, that’s okay”! Thanks for this Rachel. These reflections really touch a sensitive nerve for the entire historical enterprise, I think. To be honest, I’ve increasingly come to favour the *implied* perhaps — that is, the tacit understanding among historians and our readers that *of course* there’s no definitive answer, and *of course* these arguments are based on partial evidence and personal interpretation. Sometimes hedging a piece round with perhapses and may haves and could possiblys (or a favourite, “We could easily imagine that…”) and so on gives the impression that it could ever be otherwise. And it can block up the flow. Yet it’s also important to keep both historians and readers aware that the work is always a conjecture. Sometimes, perhaps an implied perhaps isn’t enough. Thanks for your comment, Tom. In most cases, I think you’re right that an implied perhaps is acceptable. I just happen to have written a dissertation in which the underlying argument is “Food is more important than anything else, ever!” and so multiple perhapses are much more necessary in my case, for what I hope are obvious reasons. At some point I’m going to have to read your full work, because every time I teach Mary Rowlandson or Joseph Plumb Martin I become increasingly convinced that your argument is spot on and shouldn’t be as controversial as it appears to be. If a work has many “perhaps” or conjectures, is it history, speculative history or not that far from dabbling with historical fiction? I love everything you said about revisions, etc. I still argue that, stylistically, Demos didn’t need to use the word “perhaps” so many times. EUNICE!!! I definitely know I insert a lot more “perhapses” after presenting portions of the project at various conferences and colloquiums! Great post. I’ve heard students make the same complaint about the use of perhaps in Martha Hodes’s The Sea Captain’s Wife (also about a woman named Eunice, coincidentally). Students often misread Hodes’s admission of lack of certainty as evidence of her lack of expertise or authority. I think the suppositional voice can be especially problematic for women authors, since their authority tends to be suspect already in the minds of many readers. Attuned to my students’ complaints about the perhaps in Hodes, I chose to risk more, rather than less, in my last book. Readers should know that the book is my interpretation of events based on incomplete sources, like all works of history. I didn’t feel the need to remind them at every turn. As you work on the book revisions, I would encourage you to stick to your guns where you believe in your interpretation. Making a forceful argument – what some might call a polemical argument – generates discussion. Sure some readers will disagree with you, but others will be persuaded. What’s the use in writing an anodyne book that no one will find fault with? Thanks for the alternate point of view, Rachel. I don’t imagine I’m writing a book that everyone will agree with, but your perspective is useful for reminding myself of that fact. I have had a similar experience with student responses to Jon Sensbach, Rebecca’s Revival. They seem to think it’s absurd to try to write a book about someone with so little direct evidence. Me: But it’s creative and imaginative! Them: What do imagination and creativity have to do with history?! Sigh. As for The Unredeemed Captive, my principal complaint about that book has always been that it only pretends to be about Native Americans. It’s an exploration of Puritan guilt, a rumination on father-daughter relationships, and probably several other things, but it doesn’t begin to do justice to the Native side of the Deerfield raid story. For that, Evan Haefeli’s book with Kevin Sweeney, Captors and Captives, is infinitely better–one of the most underrated works of early American history of the past 15 years in my opinion. It would be a harder sell for a survey course, but every early Americanist should read it! Thanks for the cite–I’ll add it to my to-read list! This is an extremely important point. I have seen it repeatedly with my students over the years. Yeah, this is a tricky issue. Some readers will be turned off or confused by too many perhapses. But I find it even more frustrating when an author asserts something as factual when the footnotes reveal they don’t actually have any evidence. So I think it’s best to err on the side of caution so long as one doesn’t overdo it. And I think that the idea of an “implied ‘perhaps'” works when referring to the argument one is making because arguments are of course matters of opinion and are fallible. But when it comes to asserting what we believe are probably facts, I think it is important to acknowledge that they “perhaps,” “probably,” or “almost certainly” happened/thought etc. This is a really good post. For myself, I use “perhaps” a lot not when discussing my argument, as I think you are saying, but when guessing about some part of a narrative that I cannot entirely reconstruct from sources. And, perhaps I use perhaps overmuch too. Great post. For my first book, an external reviewer flagged my only “perhaps in around 120,000 words. More to the point, “perhaps” is necessary when we must conjecture based on limited evidence. A search of The Hemingses of Monticello reviews 140 perhapses. False certainty should not be a interpretational virtue.